The opioid epidemic is on the news, in the papers, and all over social media – word has spread everywhere. It’s a national crisis. While, as Tennesseans, we may want to think our small towns and rural background makes us more immune to the problem, the truth is quite unsettling. At the peak in 2012, TN had an average of 1.4 opioid prescriptions for EVERY TENNESSEAN. This was the 2nd highest in the country. Since then, Tennessee has taken great strides to reduce opioid prescriptions and increase treatment availability. Progress has been made in several areas. Researchers believe that with the efforts to reduce opioid prescriptions, patients who were already using opioids are turning to heroin and other synthetic opioids. These illegal drugs have a higher rate of overdose due to the variation in purity and strength. Users do not really know what they are taking and therefore may take too much. According to data from GoodRx, an online prescription cost service, Americans fill over 4 BILLION prescriptions a year. 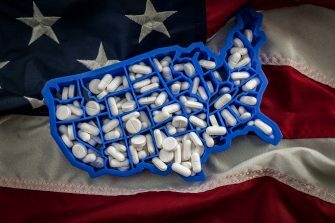 The company assessed the top drugs prescribed in each state from March 2017 to February 2018. This revealed that in 10 states, 4 of which border Tennessee, the most prescribed drugs are opioid pain pills. However, for TN, the most prescribed drug is Suboxone, a drug used to treat opioid addiction. While searching for pain management options at federally subsidized clinics in St. Louis, administrators contacted Logan University (an educational institution offering the doctorate of chiropractic degree among others) and formed a partnership to provide chiropractic care to their patients. One year later, 80% of the patients who had received chiropractic care had been able to DECREASE their reliance on pain medication! As the opioid crisis continues, the chiropractic community is ready and available to help patients with pain management issues. By using chiropractic as a first line treatment for back pain, patients may be able to avoid developing opioid addiction altogether. For those already on pain medications, chiropractic provides safe pain relief during and/or after addiction treatment. Find a doctor of chiropractic near you here.